All materials contract as they get colder and colder and become more dense until the point where they freeze. Water is very unique. When it freezes, it actually expands and becomes less dense! That is why ice floats on top of water – it is less dense. This expansion is truly a Force of Nature – nothing can stop the 11% expansion. When the water is contained, as it is inside of a pipe, this expansion will rupture the pipe (or any other container – consider a frozen can of soda or bottle of wine)! Watch PuroClean Regional Director Will Southcombe share the top 3 tips on how to avoid frozen pipes and expensive water damage, in this video from the Weather Network. The water from swimming pool and water sprinkler supply lines should be drained following manufacturer’s or installer’s directions. The use of antifreeze in these lines should be avoided if possible (keeping in mind that antifreeze is environmentally harmful, and is very dangerous to humans, pets, wildlife, and landscaping). Hoses used outdoors should be disconnected, drained, and stored. Inside valves supplying outdoor hose bibs must be closed. The outside hose bibs should be open, to allow water to drain. Outside valve must be kept open, so that any water remaining in the pipe can expand without causing the pipe to break. In the basement, crawl space, attic, garage, and under kitchen and bathroom cabinets where water supply lines are located in unheated areas, both hot and cold water pipes should be checked and insulated to help prevent freezing. ​Specific products made to insulate water pipes, like a “pipe sleeve” or UL-listed “heat tape,” “heat cable,” or similar materials can be installed on exposed water pipes. If no one will be home for an extended period of time during cold weather, the heat in the home should be left on, set to a temperature no lower than 50° F. The Master Valve to the home should be shut off. All taps should be left “open.” If the home loses power, the open valves will help prevent pipes from bursting, and the “shut-off” Master Valve means that even if there is a break, the result will be minor, compared to an open line running wild! Even with all of the above measures, homeowners should arrange for a neighbor to walk through the home daily – just to keep an eye on unforeseen events! Freezing pipe conditions should be monitored and a faucet should be allowed to drip slightly. 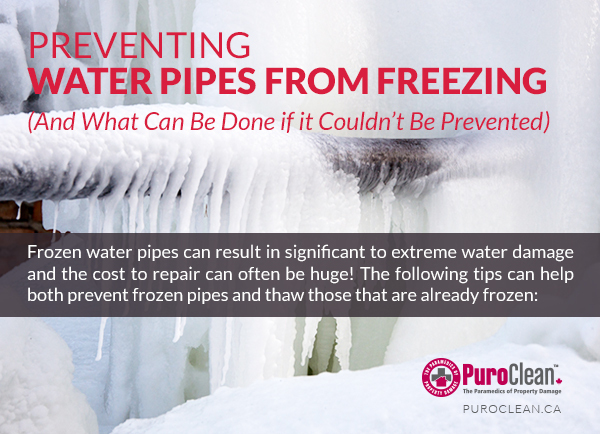 Moving water (even a drip) will help prevent pipes from freezing. During cold winter weather, garage doors must be kept closed if there are water supply lines in the garage. Kitchen and bathroom cabinet doors should be kept open, to allow warmer air to circulate around the plumbing. Harmful cleaners and household chemicals must be moved up out of the reach of children. What can be done if a pipe is suspected to be frozen? The reduced water flow from a faucet is the first sign of freezing. The most likely places for frozen pipes include against exterior walls or where the water service enters the home through the foundation. Running water through the pipe will help melt the ice in the pipe as water flows through the pipe. Heat should be applied to the section of pipe using an electric heating pad wrapped around the pipe, an electric hair dryer, a portable space heater (kept away from flammable materials), or by wrapping pipes with towels soaked in hot water. Blowtorches, kerosene or propane heaters, charcoal stoves, or other open flame device should never be used for this purpose. IT IS ESSENTIAL THAT THE FAUCET IS OPEN AND THAT THAWING BEGINS ON THE FAUCET SIDE. If the heat is placed in the “middle” of a frozen section, that section will melt. Since both sides are still frozen, that water may turn to steam and could cause the pipe to explode! When starting next to the faucet, any water (or steam) can escape through that faucet and help prevent damage/harm. Heat should be applied until full water pressure is restored. If the frozen area cannot be located, is not accessible, or if the pipe cannot be thawed, a licensed plumber must be called. • All other faucets in the home must be checked to find out if there are additional frozen pipes. If one pipe freezes, others may freeze, too. After the pipes have thawed, all water lines to faucets and the icemaker must be turned off, and the water meter should be monitored for any unseen leaks. If a pipe bursts, the water must be shut off at the main valve. Then a plumber must be called (it helps to keep an emergency number nearby for quick access). Then call PuroClean to evaluate and remediate any water damage that could have resulted. Regardless of the circumstances — dealing with broken pipes or other water damage, puff-backs or other fire/smoke damage, odors, mold remediation, or even biohazard remediation – call your local PuroClean office, The Paramedics of Property Damage. For all property damage situations, these professionals are standing by. They will mitigate the loss to prevent further damage and will then provide restoration services to return the property to a pre-loss condition as quickly as possible. All PuroClean offices have well-trained professional technicians who provide the latest state-of-the-science services to all property damaged from water, fire, smoke, mold, and other disasters.